Frontiers in Ecology: Plastic Waste in Oceans Poisoning People? The term "nurdle" may sound cute, but in reality, these cylindrical shaped plastic pellets used in manufacturing and packaging are making a big mess of the health of our oceans -- and probably of people who eat fish. For marine life, nurdles can be poison pills. They look like fish eggs, yet soak up and concentrate toxic pollutants such as PCBs. Tokyo University geochemist Hideshige Takada has found that plastic pellets eaten by birds concentrate toxic chemicals to as high as one million times their normal levels in seawater. Of course, birds aren't the only victims. At the University of Plymouth, marine biologist Richard Thompson points out that nurdles and other plastic trash inevitably break down, through the force of tides and ultraviolet light, into ever-tinier fragments. He has found some pieces as small as 20 microns - smaller than an human hair -- which are easily consumed by some of the sea's most diminutive creatures. He assumes the plastic bits, which decompose but don't ever biodegrade, are eventually ground down into powder, which can be swallowed even by zooplankton. Scientists have yet to pinpoint the impact on the marine food web or on people who eat fish that have eaten nurdles and other nurdle-eaters. But I think it's fair to say that it doesn't look good for those of us at the top of the food chain. Amazingly, as Ellison reports, a prominent marine biologist reveals that, "the plastic outweighs the plankton 6 to 1 in the central Pacific, and 2.5 to 1 in the surface waters of southern California." Fortunately, officials are starting to take action to curtail the use of nurdles and nurdle-related materials. In addition to a bill making its way through the California State legislature, Santa Monica and San Francisco have banned Styrofoam for restaurant take-out. San Francisco recently became the first US city to ban plastic bags. As Alan Weisman recounts in his new book, The World Without Us...biodegradable plastics...(are) a mixture of cellulose and polymers. Once the cellulose starch breaks down, thousands of clear, nearly invisible plastic particles remain. Ellison notes the recommendation of marine biologist, Thompson, that "reducing, reusing, and recycling is the answer (to keeping all these plastics out of the oceans)," adding that, "he'd support a ban on those billions of plastic bottles with non-recyclable caps." For me, one of the most important values of getting out in nature is its power to de-stress and rejuvenate. I spent this past weekend camping at a favorite spot of mine at California's Lost Coast - just me and Qanuk the collie. During the week, when crowds are sparse, the Sinkyone Wilderness' lone car camping spot (whose name I just don't want to publicize) is a literal heaven on earth. Following a rugged 5-mile dirt-road drive from Highway 1, one descends rutted switchbacks into a valley full of ancient redwoods, creek-side alders, and a meadow that sometimes contains massive Roosevelt Elk. I've seen both bobcats and bears cross the road on trips in and out. 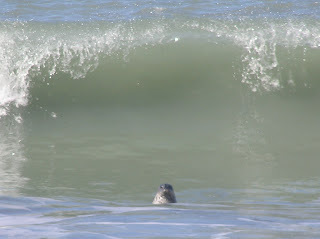 Seals pop up above the surf to get a look at what Qanuk and I are up to as we stroll down the beach. However, on the weekends -- just about every time I've visited, ATVs and other off-road vehicles have literally torn the place up, from its plants and soils to its soundscape, sending beach birds (and couples) diving for cover. Last night, a group of young adults in 3 pickup trucks blasted down a dry creek bed (that was posted as prohibited to motor vehicles) late into the night, smashing over sand dunes, through a creek, doing donuts on the beach. This morning, a couple told me they'd been sitting on the beach quietly enjoying the night and had nearly gotten run over by one of the trucks. Talk about inexcusably incompetant land management -- Qanuk the Collie could do a better job taking care of the Sinkyone than the California State Park and Tribal officials who are currently in charge. Last night was not one isolated incident. It's gross mismanagement -- failure to control an off-road vehicle abuse problem that's getting worse and worse year after year to the point that a ban is absolutely in order. The problem is not only extremely destructive to the otherwise wondrous unique natural character of the Sinkyone, but is also a clear threat to public safety. What is it with these (and way too many other) off-road vehicle drivers' complete lack of respect for other users of our public lands (as well as for the land itself)? You tell me. If it's lack of funding for enforcement that's the State's problem, here's a plan: there's thousands of dollars worth of unticketed violations that occur down there every weekend. Enforcement should be more than self sustaining -- there should even be enough violators to put some to work restoring the damage they've helped cause. ORV users often clamor for more access, and doggedly fight new restrictions. However, with irresponsible, inconsiderate, and destructive use on the increase not only in the Sinkyone, but across the country, they can only expect to see their favorite past time banned from more and more areas of our public lands. There's no place like the Sinkyone Wilderness anywhere along the California Coast. It's managers should start to treat it like the gem that it is and ban ORV's from the area. I'm off to the Eastern Sierras with Suzanne and (of course) Qanuk the collie for a weekend of hiking and hot springs. So posting the news tonight. Take a good look at the top story - written by a wonderful group of social scientists on the importance of voluntary action to the fight against climate change. Several of them - Carol Saunders, Elise Amel, and Christie Manning - I've had the pleasure of meeting and/or working with. I think they did a great job on this piece. Enjoy your weekends - don't forget to get outside and take at least a moment to listen to the songs of birds or sound of leaves rustling in the wind. Today's newsletter from Grist arrived with a story about how cleaning up the Great Lakes would actually boost the economy. According to a study released last week by the Brookings Institution, cleaning up and protecting the Great Lakes would boost the regional economy by some $50 billion -- and have a cost of only about $26 billion. Money spent to halt sewer overflows, clean up toxic spills, restore wetlands, and combat invasive species would create new jobs and at least $50 billion worth of benefits such as boosted tourism, higher property values, and attractive recreational opportunities, say researchers. Of course, we here at CV Notes love our work getting the word out about such connections between a healthier environment and a better economy! So link to us, Stumble Upon our posts (see the little "SU" icon below), and in general, help us get the word out! By the way, you can find the full study about the economic benefits of cleaning up the Great Lakes here. 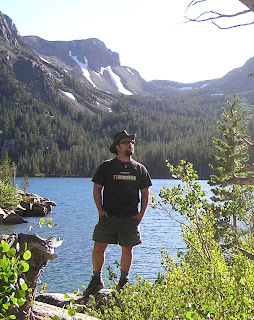 I sure wish I would have known about this little discussion that Joel Makower writes about being a part of at Burning Man. Burning Man 2007 - Was It Really 'Green' Man? "Green Man was a joke", my friend said to me yesterday when I asked her what she thought of how green Burning Was in 2007, the year its theme was "green". While in many senses, I think she was right -- Burning Man has a ways to go before it can be considered a bright green event -- I observed some wonderful progress toward this end in 2007. Gray water tub beneath our re-fillable 7-gallon water jugs. Once the tub filled, we poured the gray water into our camp's larger evaporative gray water pond. Recycling and composting: We sorted all of our waste when we got home and either recycled or composted as much as possible (at least 80% on a volume basis). Organic cotton clothing - not only my t-shirts, but even my socks were 100% organic cotton (organic or not, the socks were completely disgusting after a night on the playa). Admittedly, my festive green bell-bottoms from Piedmont Boutique on Haight Street were not organic. Or even close. We have offset our driving and home energy carbon footprints for the year by investing in Native Energy's renewable energy projects. This includes the miles we drove to and from Burning Man. Others in Ninja Camp fueled their rope lights with an electric generator charged by a solar panel, ate organic and local, and used a lot of similar green products and practices. None of us were perfect, but we did our best, inspired by the spirit of The Green Man, and of course our plain ol' passion for being green. It was all so easy that there's no reason we won't do it again in 2008, and again, and again... And not just at Burning Man! How Green Was Everything Else? As we giddily pulled past the greeters and cruised slowly towards 'home' at 9:15 and Arctic, it was immediately clear that we were far from the only ones who'd taken the Green Man theme to heart. Even as we arrived at the greeting station, the car to our right was a 50+ mpg Toyota Prius. Riding around the playa over the days to follow, I observed several biofueled VW's and Mercedes, as well as more solar installations than I can remember having ever counted down at Black Rock. are committed to green business practices, such as utilizing chlorine-free recycled paper with hemp/flax fiber and soy-based inks for ticket printing. An official Green Business, In Ticketing applauds all industry peers that have recently joined them in utilizing earth-friendly products in their businesses. What else about Burning Man - a 'Leave No Trace' event - was green? Not only do burners cut their carbon footprint by living off-grid during their stay (at least those not using CO2-belching gas and diesel generators), but the main mode of transport on The Playa is the bicycle, giving people days away from their cars. While as at any festival, I observed way too many disposable plastic water bottles, cups and jugs (and forks, knives, and plates), it was clear that thousands of burners shunned these increasingly reviled symbols of waste for re-usable ones. Whether or not their water containers were to be reused or recycled, at least the limited supply of water available to burners encourages (and perhaps even teaches) conservation! When I heard that The Man had been set on fire on Monday night, I worried that I'd not get to see the Green Man pavilion, which I'd read good things about. So as we rode up towards The Man for our first visit, passing by several beautifully sculpted trees, I was relieved to see the sustainability displays out in force. Beneath The Man, a beautiful tee-pee frame of giant logs, etched with totem-esque faces, held up the festival's 40-foot-tall name-sake figure. Beneath the green canopy, sounds of chirping birds created a serene and meditative atmosphere. Wandering over to the exhibits on the north side of The Man, the Sustainable Living Roadshow and others held educational booths that illustrated both positive green solutions, as well as negative impacts to our environment, economy and health that can be avoided via sustainability. I was awed by my first-ever close-up look at a solar car, and gawked at a large cartoon chemistry experiment-type machine full of bubbling liquid algae, which was absorbing CO2 being produced by generators. At another station, several burners were doing their best to use playadust-covered computers to calculate their ecological footprint. Over in the shelter to the south of The Man, a maze-like arrangement directed people past strikingly beautiful poster displays that educated in various aspects of the earth's deteriorating vital signs. Could the pavilion's exhibits have been better? Sure. I'd have loved to see more samples of the types of solutions that people can gradually convert to now to replace their daily products and practices with more sustainable ones (for example, samples of green clothing, electronics, cars, foods, building materials...). It was a very commendable effort though -- especially in the middle of a hot, dusty Pleistocene lake bed -- and I was glad that I got to check it out (and to be a part of Green Man in general). Ultimately, it was the art that I will remember most about Green Man. Without question, several installations left a lasting impression. First was the swinging monkeys - a brilliantly designed mind-trick of animation in which chimpanzee-sized monkeys in slightly different positions hung from a merry-go-round type wheel. As the wheel spun (via peddle power! ), rapidly flashing lights created a very real-looking illusion that the monkeys were alive and swinging from metal bar to metal bar. Second was a 50-foot-long mad-scientistesque contraption that I found in the middle of the playa on Saturday night, and had no idea what in tarnation it was. On one side of a trailer was a loud, noisy steam-billowing engine, with pipes leading down to the other side of the trailer, the sides of which contained planters full of soil and herbs such as lemonbalm, sage, and basil. After staring in complete confusion at a guy pouring pitchers of unknown goup into a boiler-like tank, a scent reminiscent of roasting coffee beans permeating the air, I had to ask what in the hell this thing was. They were burning biomass to produce energy, he told me, as he pulled up his goggles and wiped sweat from his forehead. What of the plants? One of the byproducts of the burning process, he said, was charcoal that makes for an outstanding soil amendment. Nodding my approval and wishing the guy luck, I hopped on my bike and rode north towards DJ Lorin Bassnectar's El Cirquo set. Truly amazing. an ice-berg with a polar bear on its roof, and a very real-looking polar bear itself, standing on barely a slab of ice. Both ice bergs and polar bears, of course, are victims of humanity's current fossil fuel addiction. My favorite moment of Burning Man 2007 was, without question, the blowing up of the Crude Awakening oil derrick by its Mutaytor creators. The propane ignition unleashed a mushroom cloud nearly 1,000 feet into the air - a brilliantly orchestrated metaphorical statement that the end of the age of oil is upon us (whether that ends up happening by our choice, or only after we suffer an extremely unpleasant crisis). Needless to say, at lot at Green Man was also notso green. Thousands of burners arrived via air travel, came and went in gas-guzzling RVs and trailer-pulling trucks, and burned lots of propane, wood, and...other stuff. Gas and diesel generators whirred day and night, powering RV air conditioners, reels of rope (and other) lights, and thunderous sound systems. Untold masses drank bottled water from plastic-wrapped cardboard cases, sipped cocktails from single-use plastic cups, and ate meals with disposable plates, forks, knives and spoons, disposing of waste in plastic garbage bags that won't decompose until some future eon. Even the Crappuccino at Starfuckers Oasis way out past The Temple was being offered in paper cups. How much of burners' recyclables were recycled, and compostables were composted? How many burners will recycle the non-rechargeable batteries that most probably used to power their blinky-lights? The answers to such questions are likely to only be known by soils and groundwater that lie beneath the leaky landfills in which these toxins come to rest. A Green Future for Burning Man? The Emergence of a New American Dream..? 1. Energize Black Rock City via the power of sun and wind: there is plenty of both on the playa, to say the least! If a few pilot solar and wind-power stations can be set up to help start powering RV's and sound systems so they don't need to burn gas for generators, it would be a huge coup. I'd even bet that a good number of burners would be willing to pay a small fee to be able to plug into this type of renewable power supply, and spare their generators! The electricity needs of The Man, The Temple, and Center Camp should certainly be met via wind and/or solar power. 2. A second option, of course, is to use biofuel-powered vehicles and generators. I've looked through the Burning Man Web Site's biofuels page, but are there any RV renters who offer biofueled RV's? How hard is it to get a diesel generator that can be powered with biodiesel or even straight vegetable oil? I'd love to know! A list of providers should be posted on the Burning Man web site. The amount of bottled water on the Playa is nothing short of abominable. Who knows what percent of the plastic is recycled (among burners -- a more eco-conscious bunch to be sure -- I'd love to think it's more than average. And huge kudos to RecycleCamp for what they do!). Perhaps Burning Man's organizers can more actively discourage waste, and encourage the use of re-usable water jugs, bottles, cups, and cutlery, as well as biodegradable plastics. Paper used by the festival should be a high percentage of post-consumer recycled content, including toilet paper in the porta-potties. A lot of wood is used at Burning Man, including to build The Man, himself. Was it harvested in an ecologically sound manner? Is it FSC-certified as sustainably harvested? I have no idea. But Burning Man (1) should absolutely set a good example by using good wood, and (2) can provide resources on its web site to help connect burners with sources of sustainably harvested wood - as well as sustainable products in general. As the experts in DiCaprio's 'The 11th Hour' noted time after time, raising awareness is key if we are to create the more sustainable society needed to stop and reverse climate change. Burning Man can and should maintain and improve upon 2007's Green Man-type sustainability component. Perhaps fun contests can reward the greenest burners, creating financial incentives that encourage sustainability. Burning Man has been the seed for many a good idea, and the event's coordinators can and should continue to do their part to actively lead the way towards a more sustainable future. V - Your suggestions? We'd Love to Hear Them! What are some other ideas that you have for making Burning Man 2008 even greener than Green Man? How can burners help to inspire the emerging American Dream of energy independence and a healthier, wealthier, more secure society rooted in sustainability? Let the ideas ignite! Americans Care More About Gay Marriage Than Global Warming? 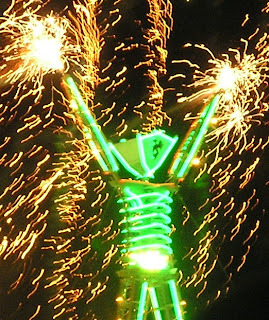 Just back from an inspiring few days at Burning Man's 2007 "Green Man"-themed event, which I'll blog about later today. I'm still formulating my thoughts on just how green it really was. As I catch up on sustainability news, I came across this provocatively-titled story from Treehugger, titled "Americans Care More About Gay Marriage Than Global Warming." 1) Americans overwhelmingly believe that global warming is occurring. 2) They don't care. "dealing with global warming" came 20th out of 23 policy priorities. 3) They won't give anything up. The cost of energy is more important than global warming. As the graph shows, 69 percent of the public is prepared to overlook disagreement about the environment and there are six issues that rate ahead of the environment in terms of the number of people who consider them dealbreakers. On one hand, this type of study can be construed to reflect a depressing failure of America's traditional media to effectively communicate the importance of taking action to stop global warming. The researchers' results indicate that to many Americans, global warming is still viewed as just an environmental issue; until it starts hitting more peoples' pocketbooks or health, it's not going to become a decisive voting issue. Coupling global warming with energy independence, higher gas prices, and national security increases the issue’s saliency. While global warming and energy are inextricably intertwined at a policy level, most voters do not see energy through an environmental lens. Action on global warming and energy independence rank as a higher priority concern than “strengthening the military and keeping America safe,” according to Democracy Corps in March 2007. As I've noted previously, solving global warming and solving Peak Oil are really opposite sides of the same coin. The same types of solutions that are needed for America to achieve energy independence - much greater efficiency, combined with cleaner fuels and clean energy technologies (and supporting tax/incentive policies to aid in their proliferation) - will also dramatically reduce our greenhouse gas emissions. 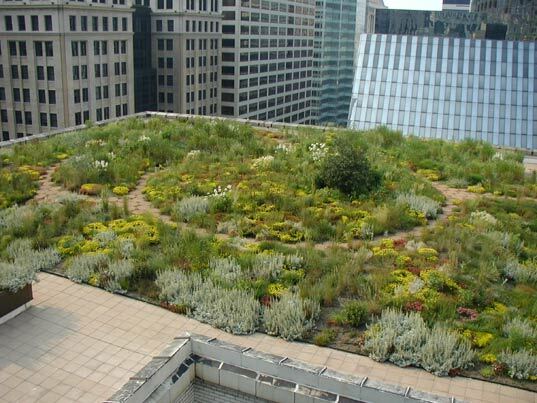 Thus, note to 2008 Presidential candidates and sustainability proponents alike - this study has some great clues for how to market and communicate the importance of fighting climate change, and the benefits of going green in general, to average Americans.